The Deo Tibba Trek in Himachal is the most outstanding expedition in the green Himalayan valleys and is popular among the trekkers endured with good mountaineering knowledge. 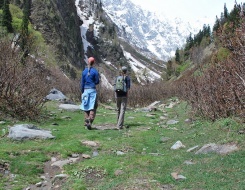 The approach of the Deo Tibba Trek can be done through Manali which is the nearest town towards the ancient village of Jagatsukh. The trek brings the expeditors to the grazing pastures of the Gaddi shepherds and the emerald blue waters of the Chandar Tal Lake (4,480 m) with magnificent views of Deo Tibba peak (6,001 m) and its huge hanging glaciers. This is a spectacular view to sizzle every trekker giving him/her a unique experience. Either at the beginning or to the end, a side tour to the top of the Rohtang Pass must be taken for fine views into the arid vastness of Lahaul. 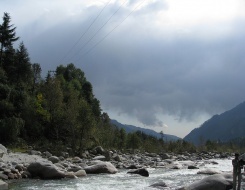 This adventurous expedition can be concluded at the upper Kullu Valley, further embarking for a visit to Dharamshala, the center of the Tibetan culture in exile. Arrival at Manali by morning time. On arrival transfer to hotel for relax and acclimatise. In the afternoon visit Hadimba temple and in the evening enjoy at mall road. Dinner and overnight stay at the hotel. After breakfast drive to Prini village, Path leads through the village By Zig-zag trail to the valley floor and offers an extensive view. Reach Khangpa village of Saten who are migrated from Spiti. (From Tibet in the olden time). Khangpa community use to move as Nomade of Chang-thang does till now. Dinner and overnight stay in camp. Trek through breathtaking landscape, the meadow surrounded by high mountain ranges to just below the Hampta Pass, on a grassy bank slope. In impressive surroundings, here rock assumes wonderful colors. Chikka (the camp site) is followed by a River, Alain Nallah and its snout is Hampta Pass finally we reaches Chikka. Dinner and overnight stay in camp. During trekking cross a river to other side of the Valley and get a beautiful view of Deo Tibba, Indrasan and Inderkilla, Hanuman Tibba (5930 Mts.) and group of summits around Beas kund and also landscape of Bara Bhangal Region. Dinner and overnight stay in camp. The whole area is surrounded by high summits, hanging glacier, and massive moraine. This is true alpine zone that we are trekking in. After noon we spend time in exploring the surroundings. Dinner and overnight stay in camp. Trek gets little steeper in the beginning and after that all the way descend down to Raurikhaudi. Local Shepard’s of Kullu Valley can be seen grazing their herds of sheep goat. Dinner and overnight stay in camp. Day 8 Raurikhaudi - Jogidugh (3000 mts/10824 ft) Lamadugh/sorotu) 4 hrs. Jogidugh occupies a very famous place in the Hindu mythology, especially for the local habitants of the Valley. Said to be a very holy place of Thakshag nag (serpent god). Dinner and overnight stay in camp. Trek along the tree line goes little down to avoid the steep cliff and again little climb along the stream. After that trek goes in a horizontal way right up to the campsite at Tilgan. 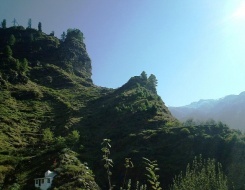 At Tilgan one can have a tremendous view of the Manali valley, town and surrounding. Dinner and overnight stay in camp. Scenic trail descend to Bhanara , there is an old temple of local God Near village and another historic cave (ARJUN GUFA) where the pandavas are believed to have taken refuge during there exile. Get down to road side and drive back to Manali. Dinner and overnight stay in hotel. Half day sight seeing at Manali, visit old Manali, Hadimba temple, Shiva temple and monastery in town are main attraction s, by evening drive to Delhi by AC Volvo coach. Overnight journey.